Beginning in 2005 IRMA began doing research to make the NACA - Langley - Jacobs - Jeep a kit in 1/72. Working initialy drawings from The Engineer in Charge data was projected using known dimensions of the cockpit and piston engine. However, it was judged that estimates were too vague with such limited information, so NASA was consulted via their NASA History Division to obtain greater technical data with more details begining with correspondence on Wednesday 5 August 2009. This led to accurate dimensions, details and some previously unkown information and photos of the engine in action! As with other IRMA kits, lets go through our parts list and building preparations. First are the parts layed out prior to assembly. Next comes numbering the parts. Additional parts, if desired, can be made from wire, tubing and other materials. First rinse all parts in soapy water to remove any release agent residue. Let them dry off. 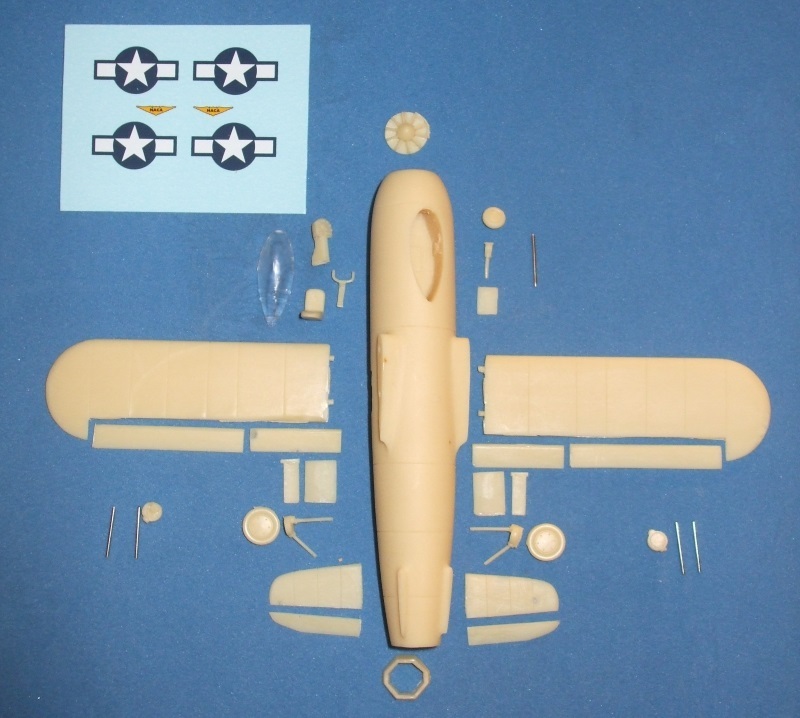 As this is a solid resin kit, it will be a tail-dragger unless the fuselage is drilled out from the back. This can be done with a dremel drilling tool or a regular drill bit. In either case make sure to keep inside of the exhaust hole. The drilling can be right up to middle of the wing. The main goal is to make the front of the fuselage heavier than the tail. Also, if the intake entrance is drilled out up to the cockpit, weight can be added in the nose such as metal washers. Additional weight can also be added to the cockpit behind the pilot's seat. Once this is done, then building can commence. First attach the port wing (2) to the fuselage (1) making sure it is at the correct angle. Follow with the starboard wing (3) again making sure it is at the correct angel. Once completed, the port aileron (4) and port flap (5) can be put in place. Next the starboard aileron (6) and starboard flap (7) can be completed. Now fasten the port tailplane (8) and starboard tailplane (9) on making sure they are at the correct angles. Then attach the port elevator (10) and starboard elevator in place. Moving up to the front of the fuselage (1) insert the pilot's seat (12) and instrument panel (13) in place. Insert the front air-duct fan (16). For the "bullet around the cockpit" version, trim the fan blades from the bullet and place the bullet in the center of the intake. Once dried, turn the fuselage (1) over and insert the front landing gear leg (17) followed by the front landing gear door (18) to the starboard side of the landing gear well. Then attach the front landing gear wheel (19). If you wish to use the metal front landing gear leg (35) then this will replace the resin one (17). Now insert the port landing gear (20) into the holes of the port landing gear wheel well. Follow this with insertion of the starboard landing gear (21) on the opposite side. Then glue the port lower landing gear door (22) and port upper landing gear door (23) at the correct angels. Next fasten on the starboard lower landing gear door (24) and starboard upper landing gear door (25). If the metal parts are selected then glue the alternative port lower landing gear strut (31) into the alternative port landing gear wheel attachment (29) and the alternative port upper landing gear strut (32). These will replace the resin port landing gear (20). For the starboard side glue the alternative lower landing gear strut (33) into the alternative landing gear wheel attachment (30) followed by the alternative upper landing gear strut (34) to replace the resin port landing gear (21). Next attach the variable exhaust nozzel (28) to the fuselage (1). Then glue on the front landing gear wheel (19) to the front landing gear leg (17) followed by fastening the port landing gear wheel (26) the the port landing gear (20) and the starboard landing gear wheel (27) to the starboard landing gear (21). Last, place the canopy (15) to the cockpit (1). Place decals as shown in diagram below. For our example we selected flat yellow which was typical for prototypes by 1943 that were being tested on the East Coast. 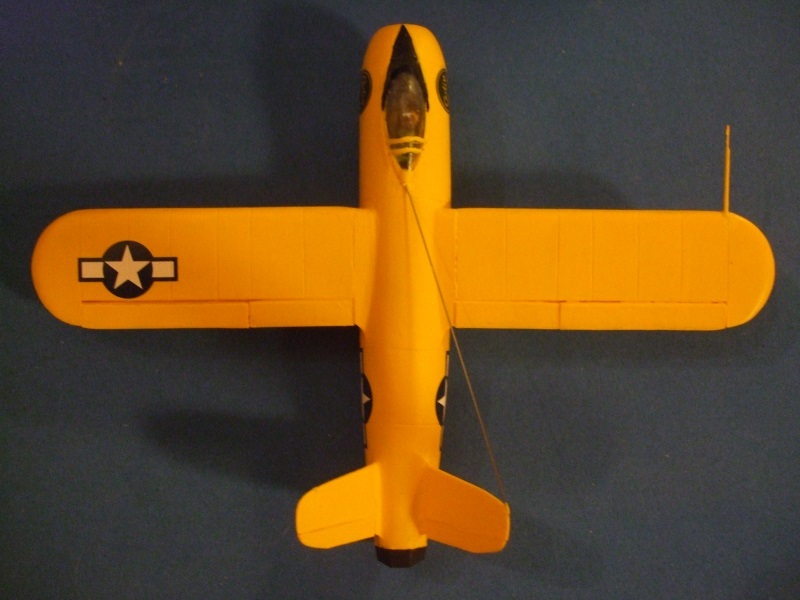 For this Tamiya XF-3 Flat Yellow was utilized. While the Bell XP-59 Airacomet and Lockheed P-80 Shooting Star prototypes were tested in USAAF overall olive drab with grey undersides, these were officially aircraft contracted from the beginning by the USAAF. As the Jeep was sloely researched and authorized by NACA, the standard yellow seemed the most approproate. The cockpit, wheelwells and landing gear were completed in Model Master Zinc Chromate Green with wheels in flat yellow with black tires via Tamiya XF-1 Flat Black. The variable exhaust nozzel is also black as is the pilot's instrument panel and anti-glare shield on the front. Since a pilot is included in our example the flightsuite is flat brown with black shoes, black belt, yellow life jacket/parachute and brown gloves. For the decals, these are the USAAF roundels as of 1943, with one placed on each side of the fuselage (1) between the main wings and tailplanes. One is also placed on top of the left wing (2) and another on the lower side of the right wing (3). 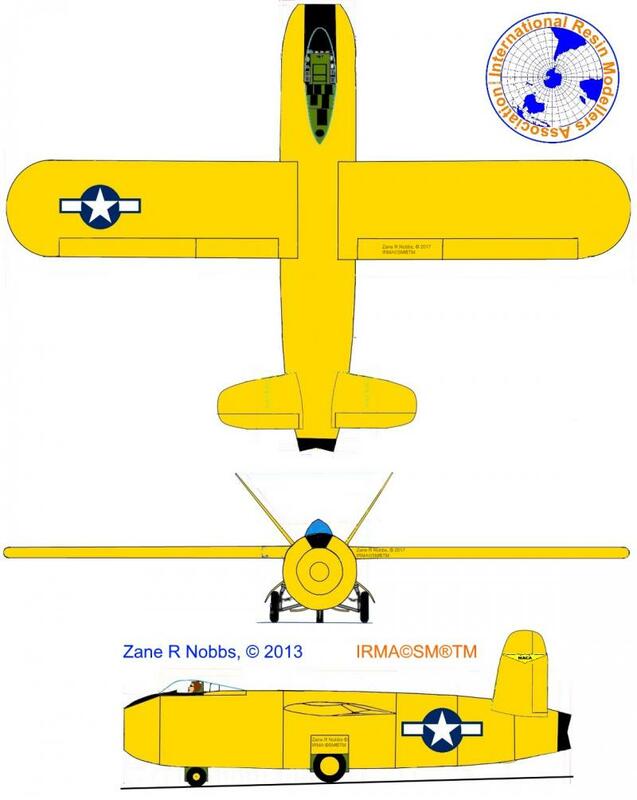 NACA decals are placed on the outside of each tailplane (8 and 9). Should a pitot tube be selected, on research aircraft it appears the nose is the most likely spot. Since the most probable builder was Curtiss-Wright, they tended to place theirs on the right-wing. Concerning an aerial, this could be on the canopy (15) or just aft of it on the fuselage (1). The aerial wire could extend to both tailplanes (8 and 9) or just to the right one (9) as this seemed to be the most common on two-ruddered aircraft. For a "what if" model, if it was USAAF in 1943-44 most likely it would have an olive drab top side with gray lower side. Of course by 1944-45 many aircraft were natural metal as the Allies gained air supremacy in Europe and Asia. The Lockheed P-80 Shooting Stars serving in Italy and the United Kingdom near the end of the war were finished in overall gray. If a USN aircraft, then 1943-44 could be a blue top with gray underneath or variable blues with a light-gray to white underside by 1944-45. And don't forget, if its a USN aircraft, it will need a tailhook. In short, it's your bird, so make it as you wish!